Salt Lake City is situated in the Salt Lake Valley in the northern part of the state, at an elevation of 4,330 feet, surrounded by the lofty Rockies. 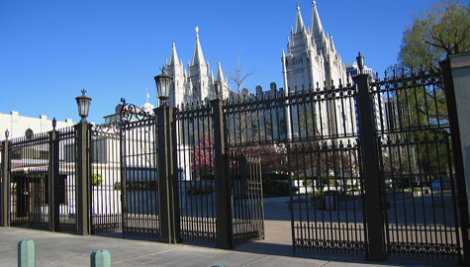 This is the seat of Mormons (Latter-Day Saints), the site of the majestic Salt Lake Temple, the home of the renowned Mormon Tabernacle Choir. It is also the state capital. Of course, Salt Lake has everything one would expect in a major US city, including a good selection of hotels, restaurants, shopping malls, galleries, museums, parks, and so forth. And then it has more: a rich collection of churches, cathedrals, historical museums, monuments and gardens, and several miles of scenic byways and backways radiating out from the city to lead past gorgeous scenery not far from town. Salt Lake was also the site of the 2002 Winter Olympic Games, and an added bonus to any visit to the city is a tour of the recreational facilities from the games. Among them are several outdoor sites and ski resorts at nearby Park City and Soldier Hollow, together with such indoor sites as the huge Delta Center, venue for figure skating; the E Center and Peaks Ice Arena, venues for Olympic ice hockey; and the Utah Olympic Oval, speed skating venue. Salt Lake City is Utah’s largest city, with a population of roughly 182,000. It is also the hub for Delta Airlines, with several other airlines offering scheduled flights in and out of the city. The city can also be reached from neighboring states by way of the north-south Interstate 15, or the east- west Interstate 80.